When you live in an apartment or a small home, it’s important to find creative ways to make the property seem more spacious. Opening up the property and giving the illusion of space can provide a sense of psychological comfort and can help impress visitors to the home. 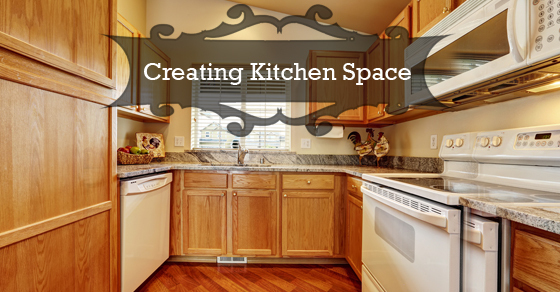 We’re taking a look at several techniques for creating the illusion of space within a small kitchen area! To create storage space in a small kitchen, it is important homeowners don’t take up further available space within the environment. One leading class option is the use of recessed shelves, which are designed to sit between the studs in the kitchen and provide an accessible storage solution that preserves the limited available room. For homeowners that don’t have available space within their kitchen area for recessed shelving, consider adding shelving to the wall space within hallways. It’s an addition that can be built to seamlessly blend with current décor. Without available light, those small spaces in a home can seem even smaller. By integrating large windows within a small kitchen space, homeowners can ensure each area of their kitchen is open and easily visible. To ensure the light streams into the space, it’s also important to keep window coverings and ornaments to a minimum. This open space can then help the kitchen appear large and full-of-life. A homeowner’s choice of flooring can have a significant impact on the sense of space within the kitchen. For example, busy flooring patters with a multitude of colours and solid lines can create a cramped feeling. On the other hand, the use of one singular colour throughout the space can present the feeling a streamlined space in which every area can be considered as part of the design. Adding decorative objects and other stylish accents above cabinetry and can draw the attention within a small space. These decorative elements can give shallow rooms more depth. For example, a simple painting placed at a high point in the room can act to make a wall area appear taller. It’s a simple visualization technique that many hope stagers now use within their work. Through simple changes, homeowners can make the most of their small kitchen area and create an open and welcoming space. To learn more on how to enhance the appeal of a small kitchen area, contact our team directly!